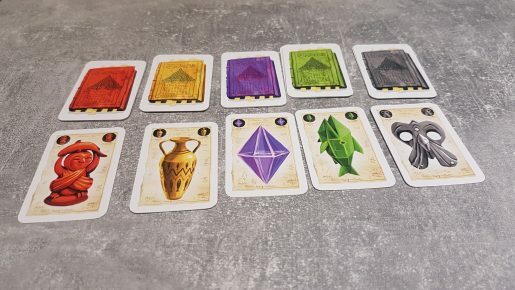 Pyramid of Pengqueen is a retheming of a 2008 dice rolling and memory board game called Fluch der Mumie, or Curse of the Mummy. 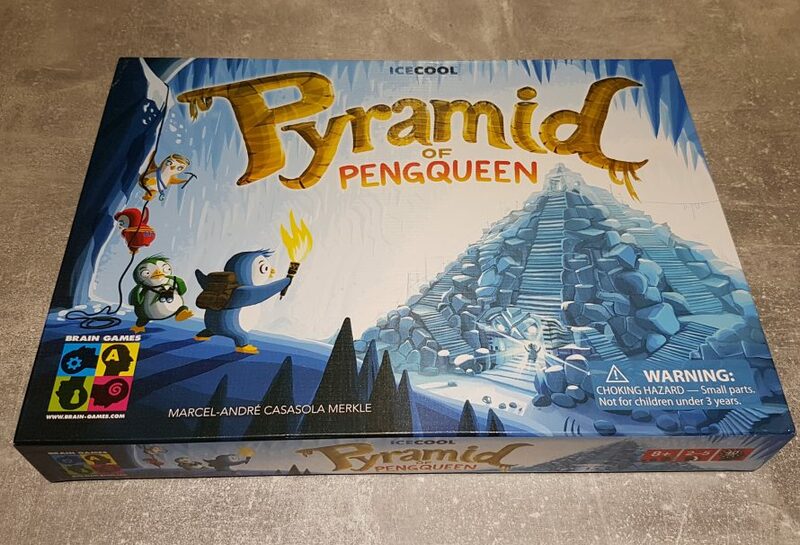 Designed by Marcel-André Casasola Merkle, the game now sees 2 – 5 players involved in a penguin themed treasure hunt. Instead of being caught in a high school the penguins are after treasures and could be caught by something much scarier than a teacher! However, was Brain Games right to bring the game back using the ICECOOL theme, instead of tomb raiders and a bandaged mummy? Let’s find out! 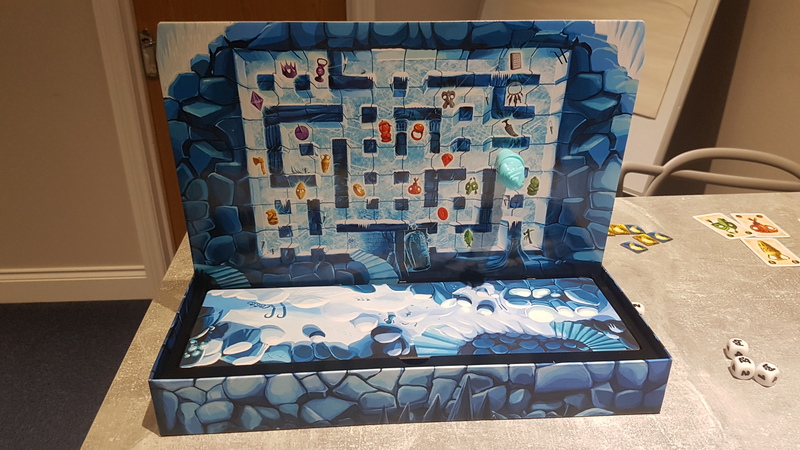 While choosing the player to play as the Pengqueen, the board is taken form the box then stood up vertically, back in the box, in the designed gap. The Pengqueen sits on one side of the board, while the treasure hunters sit the other, both seeing the same map. The map image is flipped in the right way for locations to be in the same place on the board on both sides. The Pengqueen’s large magnetic piece starts in the sarcophagus on their side of the board, with the smaller magnet – which matches the size of the penguin magnets, starting in the sarcophagus on the penguin’s side of the board. The penguin magnets all start at the tomb entrance, only on their side. Each penguin then receives a treasure card of each colour, revealing the items they must attempt to collect and then the game is ready to play. Each round all of the treasure hunting penguins get a turn, followed by the Pengqueen. On a treasure hunter turn the player gets the option to reset all dice, giving the Pengqueen player an interruption move – though this won’t be happening on the first turn. The penguin player then rolls all available dice, which feature numbers 1 – 4, the Pengqueen symbol and an arrow symbol. Any rolled dice showing the Pengqueen symbol become unavailable dice, at least for the penguins until reset. Choosing one of the dice the penguin moves the number shown or as far as they can in one direction (excluding diagonals) if choosing the arrow. Penguins must move the full number shown, though doubling back is possible. At the end of their turn if they are standing on one of their five dealt treasure cards they can, but do not have to, unveil it. While this lets the Pengqueen know their location it means they are one step closer to victory. On the Pengqueen’s turn they roll the special black dice. They are then able to move up to the number of symbols rolled plus the number of the penguin’s unavailable dice. This means, and it is entirely possible, that the Pengqueen player could roll the maximum of 3 and all 5 penguin dice could be unavailable totalling 8 movement. Penguins can, as mentioned, reset their dice at the start of their turn. However, this allows the Pengqueen to instantly move up to the number of reset dice. These dice are then available for the penguin to roll straight away. Choosing when to do this is a nice decision as it can be used when players are definitely safe or even as a bit of a bluff. Whenever the Pengqueen is moving if they come in contact with one of the penguin treasure hunters then their turn ends, though they gain one of the penguin’s life tokens. If this occurs the treasure hunter is instantly sent to the sarcophagus, and play continues with the treasure hunters. Despite having an all against one feel, only one player comes out of the game victorious. A penguin can win if they are the first to unveil their five treasure cards. The Pengqueen wins by taking a number of life tokens, the amount determined by the player count. If players start to think about their moves the game truly can get to the 40 minute mark on the box. This is especially the case for two player games where the treasure hunter player has to work out how to work both penguins and their movement into one plan, rather than adapting to their opponents moves. For what is a simple game it can slowly start to outstayed its welcome if the pace drops off, just nudging people allows the game to flow better and the enjoyment stay level throughout. While less of a problem when the player count grows the game can be slightly frustrating for the Pengqueen player. It is entirely possible if the treasure hunter players continually get lucky with rolls that you can be blindly chasing them around for 10+ minutes unsuccessfully. Conversely, if you manage to get lucky and catch a treasure hunter while near the sarcophagus the game can become too easy. It can all hinge on that first capture and the dice rolls, fine for fun factor but not players looking for a detective like deduction experience. The vertical board is certainly a striking feature of the game, though it is there as much for the gameplay as much as a wow factor. Having such a large board instantly splits the table, allowing the treasure hunter side to easily move their penguins without the Pengqueen seeing exactly where they move to via their hands. Naturally, some movements can be deduced, or eye movements read, but it is is nigh on impossible to get it perfect, something the board is responsible for. Having the board like this also allows the treasure hunters to have their treasure cards face up without worrying the if Pengqueen can see, so you don’t even have to remember your objectives. The size of the board is a huge plus point. Alas, the size of the treasure hunter penguins and the small Pengqueen magnet side are too small. These tiny penguins are hard to see in the pictures and that is fairly consistent with real life. Why these aren’t larger, with stronger magnets (especially for the Pengqueen player marker) I’m not sure – as this would drastically improve the production quality of the game. On the plus side, there is somewhat of a satisfying magnetic clink when the Pengqueen catches a penguin, at least when they hit perfectly. Pyramid of Pengqueen offers a deductive style game but by including dice rolling makes it somewhat prone to luck based outcomes. This may put some players off but it allows the treasure hunters to push their luck, making close encounters even more tense. 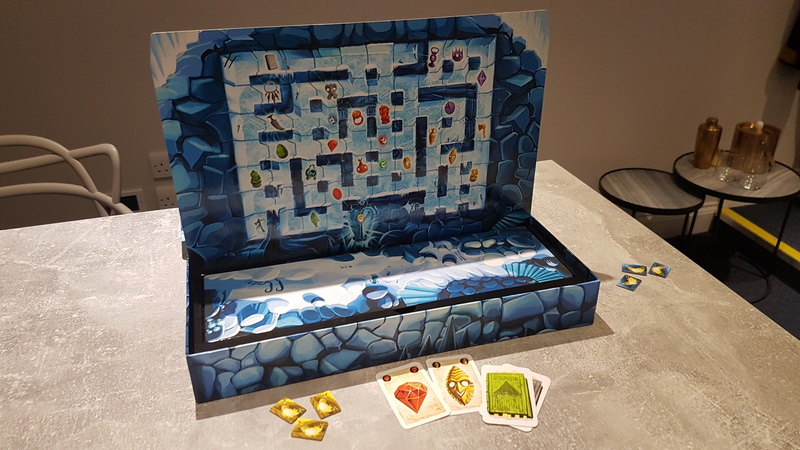 The world of ICECOOL has been overlaid onto the game and while it doesn’t 100% fit, as much as traditional tomb raiders, the lighthearted nature of the theme does match the gameplay. It won’t be for everyone, yet there is fun to be had – at least as the treasure hunters!